We've sold several types of pressure gauges over the years but the best we've sold has been the Accugauge. The Accugauge actually measures the difference between the air under pressure supplied to it, and the gauge's outer atmospheric pressure, to deliver a highly accurate reading of the difference between the actual outer barometric pressure and the rise of pressure internally through the gauge. The difference is displayed on a dial by a needle in PSI or Bar. (barometric atmospheres). Cheaper pencil type gauges merely read pressure against an inner spring, in essence measuring air resistance against a spring resistance rather than the difference between inner and outer atmospheres. The spring type gauges rely on the quality of the spring for their accuracy. We've also looked at modestly priced digital gauges and not found them as accurate, even though they cost more. The probable reason is that they are trying to convert an analog pressure reading, from a spring or pressure transducer, into digital information. Their reliance on the quality of the spring or transducer may introduce some error or possibly the A to D converter doesn't fully compensate for outer barometric pressure. At the very least the digital gauges seem to over complicate what should be a simple matter. 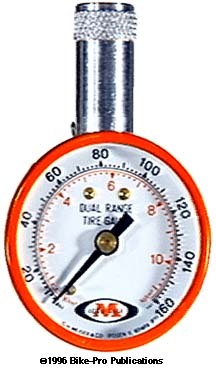 The gauge reads up to 160 PSI or 11 barometric atmospheres. 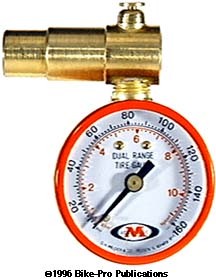 There are two versions of the Accugauge, one gives a momentary reading of the pressure until the gauge is pulled away from the valve stem, the other has a small reservoir and a releasable check valve so that it can read the inner tube's air pressure and hold it internally so you can take the gauge off the valve to read it. Pressing a small button at the base of the machined brass extension releases the pressure from the gauge it so can take a new reading. Both the holding and non-holding Accugauge come with either a Presta or Schraeder air chuck which you will have to specify at time of ordering. The Schraeder gauge will read accurately the pressure of a Presta tube, if you use a Presta to Schraeder adapter. Just under three inches long the holding Accugauge weighs 95.5 grams, while the non-holding weighs 59 grams.